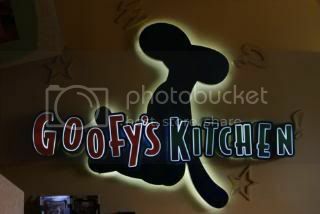 Goofy’s Kitchen, located inside the Disneyland Resort is character dining that serves brunch and dinner. I had heard nothing but great things about this character dining experience so I decided to book it for brunch ($35.96 - tip included). We arrived on time for our 10:30 am Priority Seating and checked in. We waited about 10 minutes before we were called for our photo op with Pluto. Then we waited about 5 minutes or so before being called for our table. I had expected this place to be crazy and packed with people considering the wait time. 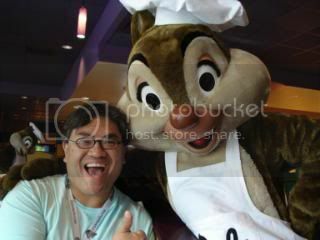 However I was surprised to find it only slightly busy, nothing like a character dining restaurant in the World. Our server took our drink order of OJ and coffee. We headed off to the buffet, which had a very large selection of food choices. There was a hot item counter with food such as scrambled eggs, breakfast meats, potatoes, enchiladas, even a create-your-own omelet station and more. Then there was the cold items; salad bar, meat and cheese platter, fresh fruit, yogurt and more. They also had an area with pizzas (like Goofy’s house special peanut butter and jelly pizza) and dessert items. I started off with the more traditional breakfast item. 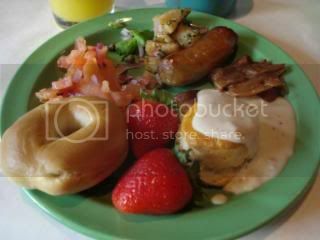 Bagel with cream cheese, smoked salmon and onion, biscuits and gravy, breakfast potatoes, sausage, bacon and fresh fruit. 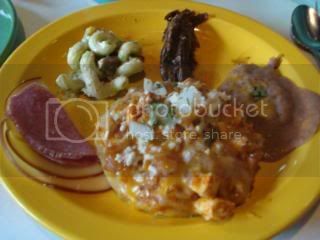 Then it was on to the brunch type items; meat and cheese, olives, macarroni salad, refried beans and an open faced enchilada. Everything was very good. The only thing that wouldn’t get again was the open faced enchilada - it was very bland and the base was very chewy. Now it was time to get dessert. 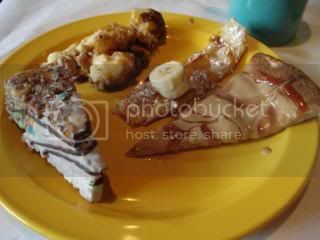 I went with the banana crepes, rice crispy tower, bread pudding and peanut butter and jelly pizza. My favorite was the peanut butter and jelly pizza that Alice had recommended. She said it was Goofy specialty. If I wasn’t so full I would have had another piece. During our meal we were greeted by Dale, Balloo, Alice, Chef Goofy, Princess Jasmine and lastly Chip, which all posed for pictures with each of us since there was no one to take our picture. Dale, Chip and Jasmine all carried Sharpies and as they came by the tables signed their name on the white table clothes. All of the characters took time at each table and were absolutely wonderful. In addition, every hour Goofy goes to the brunch area and get the kids to get up and dance with him. It looked like a lot of fun and I might have joined in if I was a little hungry. Before the end of the meal the photographer comes by with the photos of you and Goofy. They come with an 8 X 10 of you with Pluto, an 8 X 10 of you holding Tink and (2) 4 x 6 of the Tink picture. This is a restaurant that I would highly recommend trying to anyone who wants a good meal and great character interaction. I will definitely be returning to Goofy’s Kitchen on my next visit to Disneyland. This restaurant gets a 4 out of 5 Mickeys. When did you go there? I've been trying to decide if I should add this to our list. We went at the begining of Sept 09. I'd recommend adding it to your list. I found the food to not be anywhere near as good in DL as in WDW. However, this was a great character breakfast. I'd do it again in a heartbeat. It definitely is on-par with, if not better than some of the WDW character breakfasts.